Around 700 000 learners wrote Matric last year, and while many will be heading off to university soon, the sad truth is nearly half of all students that enter university now would have dropped out by the end of the year. This is the view of Annelie Oosthuizen, general manager of the International Pre-University College (IPC) in Johannesburg, who says the improved 2013 matric results are unlikely to translate into the same university success, largely because of the inadequate preparation of Grade 12 learners for tertiary education. “Good matric results are great, but they don’t guarantee university success. Our experience at the IPC is that Grade 12 learners are not properly prepared for university. There is a significant difference between what is expected of learners in high school compared to university,” says Oosthuizen. She adds that as a direct result of this, South Africa has a high university dropout rate. “An estimated 40% of students drop out during their first year of university and a further 20% during their second and third years. A recent study of the Council for Higher Education regarding the failure rates at tertiary institutions showed that only 27% of students who study fulltime finish their degree in the time allocated, and up to 55% who begin studies do not graduate. The report blamed the school system for ill-prepared students. We strongly believe students need to be better equipped to handle the challenges of university, especially if the dismal graduation rate of just 15% – as revealed in the Department of Higher Education and Training’s first annual statistical report last year – is to be improved,” says Oosthuizen. This mirrors comments made by Professor Jonathan Jansen, the rector and vice-chancellor of the University of the Free State, at an IPC event late last year, where he warned of the far-reaching consequences of inadequate university preparation. “Students need preparation to study further. Coming straight from high school, many are not prepared for the real world, and we’re seeing this in the high university dropout rate and graduates’ inadequate skills development when they do eventually enter the workplace. These are just two of the serious consequences of the system’s failure to successfully transition learners from secondary school level to tertiary level,” he said. 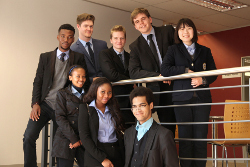 The IPC is an independent school that specifically focuses on providing secondary school learners with the skills, direction and qualifications they need to succeed at university. It bridges the gap between matric and university by offering a one-year pre-university course that provides students with a more advanced academic understanding. As a University of Cambridge International Examinations Centre, it offers internationally recognised IGCSE, AS and A Level courses that qualify for matriculation exemption and are accepted at South African universities. The IPC is currently accepting students for the 2014 academic year. Although students are advised to register now, at the start of the new academic year, registration is open all year round and students can register at any time. There are two Cambridge international examinations sittings – in May/June and Oct/Nov. There is still space available for the 2014 year, with an orientation programme currently taking place, until 24 January 2014. All prospective students are invited to attend these open days, which introduce the IPC lecturers and the subjects they teach through informative lectures and workshops. The IPC’s annual full-time package price automatically includes the international examination fees, and it offers a 10% fee discount where two siblings register for the full-time package in the same academic year. Classes officially start on 27 January 2014. The results of last year’s international examinations will be published on 24 January 2014.